Export trade is the hallmark of Singapore’s economy. The country shows the strongest propensity in Asia Pacific to use trade credit in B2B transactions in the home market and abroad. In times of global economic uncertainty and subdued demand, Singapore’s export orientation implies that the country is indirectly impacted by the many challenges affecting the business and insolvency environments of its major export destinations China, the Eurozone and the United States. Besides the weaker demand from China, the low commodity prices build pressure on the oil and gas industry, which plays a major role in the country’s exports. To offset these challenges, businesses in Singapore, particularly those trading internationally, focus on protecting their liquidity position against the risk of payment default arising from B2B trade on credit. According to survey findings, Singapore seems to be the most trade credit friendly country in Asia Pacific. Nearly 55% of the total value of B2B sales of the suppliers surveyed in Singapore are made on credit. This compares to 49% last year, and a regional average of 46%. This openness to the use of trade credit in B2B transactions reflects the nature of Singapore’s economy, as one of the most market-oriented and open economies worldwide. With 56.6% (46.7% last year) of the domestic and 52.4% (45.2% one year ago) of the value of foreign B2B sales made on credit, suppliers surveyed in Singapore show the most uniform approach to offering credit terms in B2B trade, as well as the strongest likelihood of selling on credit to overseas customers, among the countries surveyed in Asia Pacific. 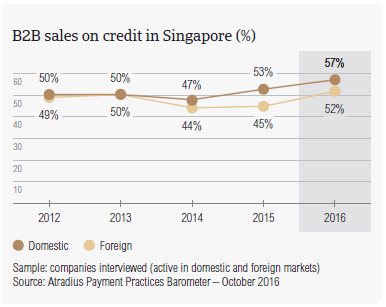 Singapore’s proportion of export sales on credit appears to be far higher than the regional average of 42% for Asia Pacific. This is consistent with the fact that Singapore derives most of its trade revenues from transactions with overseas customers, particularly in the machinery, electronics fuel and chemical products industries. 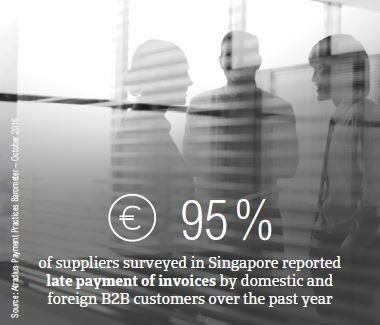 More suppliers surveyed in Singapore (95%) than in Asia Pacific (88%) reported having experienced late payment of invoices by domestic and foreign B2B customers over the past year. This resulted in an average of 44% of the total value of B2B receivables remaining unpaid at the due date. This is in line with the average for Asia Pacific (44%). 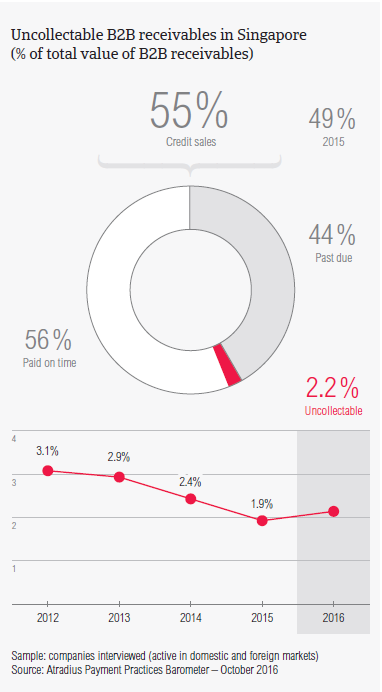 On average, 47% of the total value of domestic B2B invoices in Singapore was paid late. This was the case for nearly 41% of the total value of the invoices issued by suppliers surveyed in Singapore to their B2B customers overseas. Compared to last year, both the domestic and the foreign default rates in Singapore remained stable. This likely reflects the strong focus that companies in Singapore have on effective credit risk management, as this is essential to safely growing the business, particularly in a country with a very strong propensity to offer trade credit to B2B customers. Late payment of (domestic and foreign) B2B invoices in Singapore is reflected in the average Days Sales Outstanding (DSO) figure of the survey respondents. Despite no variation in either domestic or foreign late payment rates in Singapore, the average 46 days DSO recorded in the country is six days longer than last year (regional average: 41 days). This likely reflects less efficient collection of long outstanding invoices of high value by suppliers in Singapore. 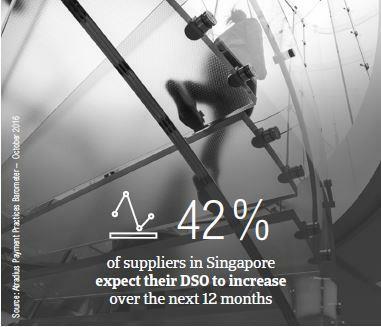 Significantly more suppliers in Singapore expect their DSO to increase over the next 12 months (42%, in line with the response rate in Asia Pacific) than decrease than expect DSO to decrease (13%). This reflects concerns expressed by businesses in Asia Pacific over maintaining adequate cash flow levels. 46% of suppliers surveyed in the country, however, do not anticipate changes in DSO over the same time frame (this is in line with the response rate in Asia Pacific). The majority of the suppliers surveyed in Singapore (21%, compared to 14% in Asia Pacific ) consider a likely fall in demand for their products and services to be the greatest challenge to business profitability. This concern comes as no surprise in a country which has the highest trade to GDP ratio in the world, and is strongly active in assisting trading companies to expand with new overseas operations. As many suppliers surveyed in the country (21%), as in Asia Pacific (20%), are concerned about their cash flow levels. In Singapore, this may reflect suppliers’ concerns about an increase in DSO, which could potentially worsen their liquidity position, due to the increase in financial and administrative costs of carrying long outstanding trade receivables. In Singapore, suppliers ask domestic B2B customers to pay invoices, on average, within 33 days of the invoice date (average for Asia Pacific: 32 days). Foreign customers are requested to settle invoices almost within the same time frame (on average, within 36 days from the due date). Over the past year, the average domestic terms in Singapore remained stable. In contrast, average payment terms offered to foreign B2B customers were lengthened by an average of five days. Offering more flexible payment terms can improve success in winning new sales contracts on export markets, which tallies with the export driven nature of Singapore’s economy. 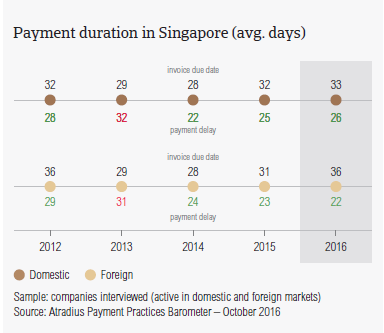 Despite being granted longer payment terms than one year ago, foreign B2B customers of suppliers in Singapore settle past due payments almost within the same time frame as domestic customers do (on average, 24 days after the invoice due date). These timings have remained stable over the past year. This means that suppliers in Singapore turn overdue invoices into cash, on average, around two months from invoicing. This is in line with the average for Asia Pacific. As many suppliers in Singapore (47%, stable from last year) as in Asia Pacific (46%) expressed the opinion that their domestic B2B customers pay invoices late due to liquidity constraints. However, more suppliers in Singapore (nearly 35%) than in Asia Pacific (27%) are convinced that domestic B2B customers delay payment of invoices intentionally as a form of business financing. The response rate for Singapore is stable compared to last year, suggesting this is a consolidated opinion in the country’s business environment. Notably more suppliers in Singapore (45%, up from 40% last year) than in Asia Pacific (nearly 34%) reported that foreign late payment is most often due to liquidity constraints of the customer. This is the highest response rate for this reason observed in the region and contrasts the general opinion of suppliers surveyed in Asia Pacific, who consider the complexity of the payment procedure as the most frequent reason for foreign late payment. This opinion most likely reflects the geographic footprint of Singapore’s main export destinations, which include China, the European Union and the United States, whose insolvency environments are currently under pressure and likely to deteriorate or to slightly improve from high levels over the coming months. 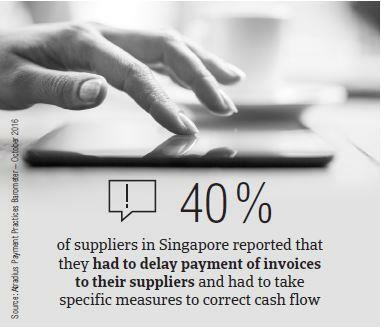 More suppliers in Singapore (40%) than in Asia Pacific (34%) reported that they had to delay payment of invoices to their suppliers and had to take specific measures to correct cash flow. Similarly, more suppliers surveyed in the country (32%) than in Asia Pacific (25%) said that late payment of invoices had no significant impact on their businesses. This tallies with the earlier mentioned strong focus of businesses in Singapore on credit risk management, which comes as no surprise since respondents in the country are more open to offering trade credit to B2B customers than all of the other Asia Pacific countries surveyed. To protect their businesses against the risk of payment default from B2B customers, half of the suppliers surveyed in Singapore will increase the use of a mix of credit management tools (checks of the customers’ creditworthiness and payment history as well as monitor the credit risk associated with the customer). 40% of suppliers surveyed in the country will either increase their bad debt reserves or request secured forms of payment from their B2B customers over the next 12 months. 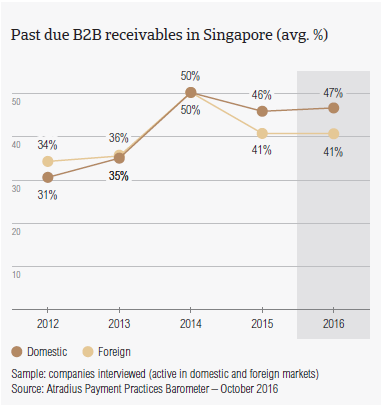 Suppliers in Singapore reported having written off 2.2% of the total value of B2B receivables as uncollectable. This is in line with the average for Asia Pacific (2.1%). Domestic uncollectable receivables were written off as often as foreign ones. The percentage of write-offs in Singapore increased slightly from 1.9% last year. This likely reflects less efficient collection of receivables. Uncollectable domestic B2B receivables originated most often from customers in the chemicals, construction, consumer durables, electronics and business services industries. In line with the regional response rate, most of the suppliers surveyed in Singapore (53%, compared to 51% at regional level) reported that they had to write off receivables as uncollectable most often because the customer went bankrupt or out of business. Notably more suppliers surveyed in the country (48%) than in Asia Pacific (37%) said that they wrote off receivables as uncollectable due to the failure of collection attempts. 32% of suppliers in Singapore (28% at regional level) reported that receivables were written off because the additional costs to pursue the debtors were too high. Suppliers surveyed in Singapore reported trading on credit terms mainly with B2B customers in the construction, consumer durables, chemicals, electronics, metals, machinery and business services industries. Invoice payment terms extended to B2B customers in the metals industry appear to be notably more relaxed (averaging 39 days from the invoice date) than those offered in the other industries surveyed. B2B customers in the chemicals industry take the longest to pay overdue receivables (on average, within 33 days after the invoice due date, compared to a 21 days average for the region). The chemicals industry also generated the largest proportion of past due B2B invoices. Nearly 55% of the total value of B2B invoices issued by suppliers in Singapore to B2B customers in this industry were paid late. The same proportion of overdue receivables was generated by the machines industry. Based on survey responses, late payment of invoices due to customers’ liquidity constraints occurred most often by the construction industry (54% of suppliers surveyed in Singapore cited this). Interestingly, late payment in the chemicals industry was reported to be most often due to disputed invoices (according to 46% of suppliers surveyed in Singapore). Most of the suppliers surveyed in Singapore (66%) are of the opinion that the payment practices of their B2B customers in the electronics industry will not change over the next 12 months. In contrast, 60% of suppliers trading with B2B customers in the construction industry expect deterioration in the payment behavior of their B2B customers over the same time frame. The same opinion has been expressed by 55% of suppliers trading with B2B customers in the chemicals and machinery industries.